WorkAndCalling: Called to Do or Called to Be? This was the week for former youth pastors to buy me lunch. At the beginning of the week it was my friend John near his office in Bellevue; at the end of the week it was my friend Steve Sankey near his office in Renton. Steve and I worked together at Northwest University; he preceded me by a number of years and then joined my team after I was on board for a few years. 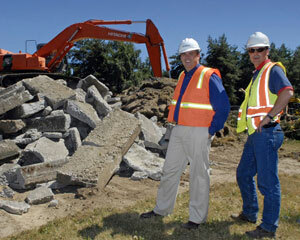 During our time together at Northwest, Steve and I built, acquired, and renovated several buildings on the campus. It was eight years ago when I asked Steve if he was ready for people to call him “Pastor Steve” again. Since then, Steve and his family have been partners in ministry as we’ve served the congregation at Pleasant Bay Church. For most of the past decade, Steve and I worked together both at the University and the Church. These days Steve’s day job is at Boeing’s facility in Renton where they make 737s. He serves as a project manager, doing similar work to what he did at Northwest… but rather than creating space for students and professors, he’s creating space for manufacturing airplanes. He manages aspects of projects that keep things on time, on budget, and according to spec. While I was there for lunch he showed me one of the projects that he was wrapping up. As production of the 737 increases, they needed additional bays adjacent to the Renton Airport. Think of them as full-hookup spots… but rather than parking an RV, they park a 737 there for a week for final testing before it takes the first flight. They plug it in and test every system, including a full load of fuel and firing up the engines. Steve showed me the three bays that will be in use next month and the two additional bays that will be available in coming months. This is good news for our region. All the 737s in the world are made right there in Renton. Increased production of that airplane is a healthy economic sign for our entire region, and even severs as a marker for the economic vitality of the world. We talked about work and calling, and the paths that the Lord leads us along. It seems that for some people, the vocational path is a pretty straight line. Education leads to employment and advancement through a career; it could be that the path aligns pretty closely that one might have mapped out as a young person. For others (like Steve and me), the path seems to make the most sense when viewed through life’s rearview mirror. While on the path (the curious path, as Steve likes to say), it doesn’t always make perfect sense. But when we look back, we can see that the Lord was in control and making things work together. Steve put it this way, “my calling, and fulfillment of that calling, makes most sense when I think in terms of what I’m called to be, rather than what I am called to do.” Right now, Steve does project management at Boeing. He doesn’t concern himself with the question of whether that is what he is called to do, because it aligns well with what he is called to be. Steve will tell you that he is called to be an implementer and helper; he’s called to be someone who helps people succeed and attain their goals. With that calling to be that kind of person, bringing his skills and experience and hard work to the task, it is easy for Steve to connect his work with God’s work. Thanks for posting this, Dan. I love the insight into how Steve approaches faith, work and calling. It's both challenging and encouraging at the same time. All these profiles are giving great insight into people we know, but we can always know more! Keep them coming!